Everyone has something to say about semicolons. But what about its less “popular” sibling, the colon? 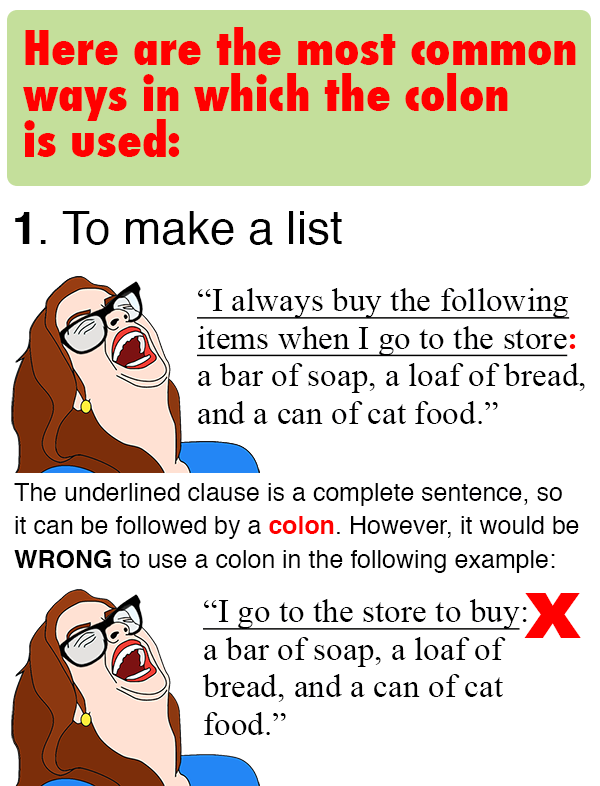 The most important thing to know about colons is that the statement before the colon has to be a complete sentence, i.e., an independent clause. In that regard, they are very much like semicolons. However, unlike semicolons, colons do not have to be followed by complete sentences. In that sense, they are “superior” to semicolons. Perhaps that’s why semicolons have the “inferior” prefix “semi-” (half; partly). We would be remiss if we didn’t mention that one of the most important standardized exams for prospective college students, the ACT, constantly misuses the colon. Now that we know how colons work, there should NOT be a colon after “that” in the question stem above. Since many high school students take both exams, it is not surprising that they find this inconsistency confusing. We won’t be holding our breath for the ACT to get its act together and remedy this situation. Instead, we’ll continue to showcase the usefulness of the versatile colon. Right, Marceline? Marceline the Vampire Queen surely appreciates colons: look at her neck.